The blind reliance on algorithms to sort and target content has resulted in a tidal wave of fake news. The resulting consumer sentiment is that all companies, not just Facebook, should guarantee greater transparency and accountability around the content they produce and the audiences they reach. While we have an opportunity to improve how we use technology to weed out disinformation, we also have a responsibility to invest in human effort to ensure the spread of high-quality news, not low-quality content. UPDAY has embraced this view. The mobile news app owned by digital publishing house Axel Springer pairs machine learning with human judgment to deliver users personalized news and information aligned with their explicit preferences and implicit requirements. Operating in 16 countries across Europe, UPDAY has established eight editorial “hubs” where teams of local journalists review content from the top news sources to pick top stories and news consumers will genuinely appreciate. Peggy Anne Salz – mobile analyst and content marketing strategist at MobileGroove – catches up with UPDAY CEO Peter Würtenberger to discuss how the company’s approach to news curation and aggregation has allowed it to build partnerships with publishers, deepen engagement with users, and optimize content delivery to a plethora of devices and platforms. PAS: AI and algorithms have a legitimate role to play in matching audiences with information they will likely appreciate. But we also see what happens when judgment is left to the machines. How do you maintain a balance? PW: Fake news happened because companies relied 100% on technology, and this is what we have avoided at UPDAY from the start. Part of it is because, unlike the Apple, Facebook, and Google, we come from the newspaper business where journalists are the most valuable resource, not an overhead. Axel Springer is one of the leading publishers in the western world, selling over 1.5 million copies of the Bild newspaper daily. This was possible because we relied on journalists. At UPDAY, rather than leave news decisions to algorithms, we combine the intelligence of machines with human judgment to deliver personalized news that doesn’t trap audiences in a filter bubble. The algorithm aggregates news—what you want to know—by understanding your personal interests and preferences out of approximately 300 hand-picked sources per country. There’s a dedicated team of Content Engineers that carefully checks each source in each country before integrating it into our source set. The human—in our case, eight editorial hubs in Europe where editorial teams on the ground curate news and information – judges and delivers what audiences need to know. This is the news of the day that matters, and we rely on a team of trained journalists in their fields to make this call. It’s about serving up the best of both worlds, the best of what technology and humans can offer when they work together. PAS: You are aggregating content from original sources and packaging it with the help of personalization for your users. Tell me about your audience and their usage. PW: The feedback we have from our users since day one is that they feel safe and confident that they are reading what really matters to them. This tells me that a user-centric approach to deliver the perfect and personalized mix of stories is working out very well. Users are engaging with UPDAY and highly appreciate the variety of our media brands. Our sources include the top 100 publishers in each of the markets where we are operating in. We launched UPDAY in March 2016 and last year we counted around 10 million users. Today we have more than 20 million users spread across 16 countries, which makes us the fastest growing news app in Europe. A user session is around 5 minutes. We have more than 3 billion page impressions per month. And we aggregate more than 3,500 sources. By the way, the publisher also gets a massive amount of traffic from UPDAY, and in some cases 10% even 15% of their mobile traffic comes from Upday. 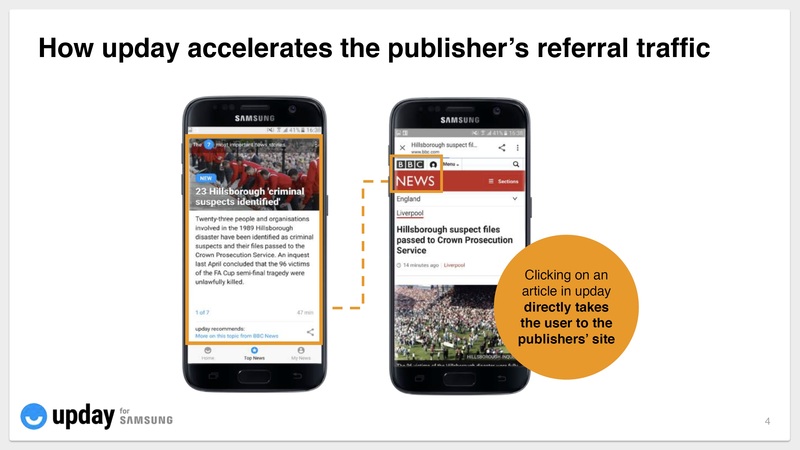 We aggregate their content—snippets with headlines and some body text from the publisher which they provide as part of the RSS feed—and, when the user clicks on the story, we send them directly to the property of that publisher. This is what publishers appreciate most. Unlike Facebook, which keeps all interaction and news consumption in its ecosystem, we drive traffic to publishers. PAS: You deliver personalized news across over a dozen countries and languages. Do you rely on translations and localization to keep it relevant, or is there something else at play? PW: We don’t translate any of the content, because that wouldn’t serve the user’s interest. Instead, we serve the users with their local sources in the local language. Our local team of journalists—the quality control, so to speak—is responsible for selecting the 30 to 40 most important top news stories per day and curating them, so they appear in the top news section we show to the user. Clearly, this isn’t the way all media companies approach localization. Some agencies prefer to translate content from English to Spanish, for example, in order to serve it to large audiences. But we don’t believe this is the right way. In our view, it’s a better experience to source the local sources and media brands in the local language. And that’s the beauty of UPDAY—and now we see that other products and offers are changing to do it this way, too. I can only say we have been doing it like this for over two years and it’s great to see how others are understanding why this is the better way to deliver news and now come up with similar offerings. PAS: You have engineered the algorithm that you pair with the human intelligence of your editorial hubs to deliver personalized news. How does this combination work to ensure the delivery of more relevant advertising alongside this news content? PW: Our editorial competence and the understanding of the user behavior enabled us developing an offering that addresses various needs of the advertisers and brands. UPDAY offers a premium user experience with a flow of content and integrated native advertising which does not disturb the flow. It’s not a layer ad that users see and click it away. It’s in the natural stream of the news stream, showing every sixth card on average. It’s also the approach that kicked our monetization forth. We started with an offering for so called direct sales – premium formats adjusted to the needs of our clients. We talked to clients and agencies and they booked display ads and video ads. At all times, our priority was to develop an advertising offering that enhances, not interrupts the user experience, where we could be the platform that brings advertisers closer to users. Our understanding of the users’ interests plays a crucial role here. We also integrated a programmatic technology into UPDAY. It became the second phase of UPDAY’s advertising. But we established our capabilities as an SSP. We did this together with AppNexus and with Google. We started with programmatic native advertising that was perfectly aligned with our content. On UPDAY every news card has a photo, a headline, and text— native advertising looks similar to that and attracts the users with a great strength. Together with the data, it boosts our capabilities to deliver the right advertising in the right moment to the right user. PAS: So, what are you seeing –and what are the lessons for other media companies that seek to monetize their assets and audiences? PW: Our click rates are beyond expectation because our experience pairs human sense with data intelligence. We are seeing between 0.5% and 0.8% for display and more than 1% for native ads – regarding formats which are non-intrusive and integrated in the flow of UPDAY news. We’ve also seen native campaigns where we get between 5% and 6% click-through thank to our optimization measures. Overall, this is far above the industry standard, which hovers at around 0.1%. It’s a combination of our human salespeople with our ad tech that leads to a success. We have teams that go to the companies and brands and say, “Hey, we have a high-quality, Europe-wide platform which is a perfect place for your marketing communication.” Once the brands realize there is more than Facebook, they are on board. We are running direct campaigns for SEAT in five major markets as a result. This is premium advertising with higher CPMs on a high-quality platform. We rely on human teams to understand what brands want to communicate and work with them—and really show them–what is possible on our platform. It’s a dual play between people and a constantly developed advertising product, and that is the play that gets advertising right. If I look out at many media companies out there, they are still filling their pages with what they have been showing for last 20 years. It’s nothing more than a copy of the first page in their newspaper. Advertising is similar. It overwhelms the user with too many blinking parts, banners and annoying interruptions. This is a mistake, and so many content companies are still stuck in this rut. I would recommend content companies change this by introducing more user-friendliness and personalization into what they offer and how they deliver it. For the companies that make the algorithms—the Facebooks and Googles that read the user signals to personalize the content and advertising—they should look for ways to introduce a human touch and ‘humanize’ their tech because that is what they are lacking. It’s got to be user first —and the advertising needs to be highly personal and highly relevant. PAS: You are also aligned with technology and your partnership Samsung is evolving to take you beyond the smartphone. What are the new opportunities on the horizon? PW: It started out as a strategic partnership between Axel Springer, an expert in journalism, news, and creating a digital information brand, and Samsung, an expert in engineering and building devices. We pair our learnings from the news business and our learning algorithm with Samsung’s leadership position in devices and distribution. Remember, globally Samsung is far bigger than Apple. However, it’s not just about having a larger share of the smartphone market. It’s about the breadth of devices and platforms where we can provide news content. We are already on the smart watch, and we are also the news source on the Family Hub that Samsung enables on its smart refrigerators. Most recently, Samsung has integrated our news app on their ambient QLED TV screens. These are screens that just turn on when you pass them, and UPDAY news is what consumers will see when they interact with that screen – across 12 countries in Europe. Now other industries are contacting us. The car industry is asking us to develop an integration for smart cars to deliver personalized news in the car. We are thinking about how we can provide news in this environment, and it’s clear that the news we aggregate will also have to be read out-loud to the consumer. PW: It has to be scalable. And you do this by making sure all the content comes from a single platform. If we were to start building content data platforms for each of the platforms we serve — for smartphones, watches, fridges and now TV — we would be dead from the sheer complexity of it. All those different devices and platforms must be served from the same content engine, from the same algorithm engine, and from the same journalists who are curating the content. This is what we have built and manage. It’s one content platform, and you see the same content — even the same headline — on all four platforms. But it will get more complicated when we add voice—and voice is coming. It’s very early in the market, and there are great text-to-speech engines around, but this is just the beginning. Some of our main challenges will be: How to deliver the most relevant content in the most convenient and appealing way to the audience? There are legal issues to solve and we have to consider ways to monetize most efficiently, of course. Print media was disrupted by the Internet and mobile is disrupting online. Now voice is poised to disrupt everything we as an industry have known or done so far. The best preparation for a media company is to be paranoid. Watch everything, experiment everywhere and execute on the ideas with potential. It’s why we maintain and motivate a startup culture in our company determined to stay alert and always be open to drastic change. It’s better we disrupt ourselves from within than risk being disrupted by a trend or technology beyond our vision.